On November 5, 1912 the Arizona Woman’s Suffrage ballot initiative passed, giving Arizona women the right to vote. It was not until 1920 when Tennessee became the 36th state to ratify the 19th Amendment to the United States Constitution that women in all states gained this same right. In 2020 Americans will celebrate the 100th anniversary of the passage of this landmark legislation. As part of Arizona’s celebration of the passage of the 19th Amendment, the Arizona Women’s History Alliance wants to honor the Arizona women who worked so hard for the passage of our state’s suffrage law. We will be launching a Suffrage Statue Campaign to place a statue of Frances Willard Munds, President of the Arizona Equal Suffrage Association, in Arizona’s capitol mall in 2020. Our first step is to get legislation passed in the Arizona Legislature giving us permission to place the statue on Wesley Bolin Plaza. As soon as that is done we will begin fundraising for the statue. 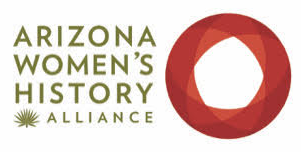 Please join the Arizona Women’s History Alliance in making history by supporting our efforts to honor a woman whose dedicated service led to Arizona women receiving the right to vote in 1912. To join us in honoring the Arizona women, you can make a donation by clicking on the Donate buttons below. Who was Frances Willard Munds? Frances Willard moved to Arizona during the 1880s and taught school in rural Arizona for several years before marrying John Munds, who later served as sheriff of Yavapai County. Frances became involved in the Arizona Women’s Christian Temperance Union in Prescott and soon discovered that women needed the power of the vote to really improve their lives. She joined the Arizona Equal Suffrage Association in 1903 and served as the organization’s president from 1909 to 1912. Arizona women had been fighting to win the vote since the 1880s and had attempted to gain suffrage through the Territorial Legislature and through the constitutional convention, but they had not succeeded. After Arizona became a state in 1912, they decided to use the newly granted power of the initiative to take the issue of woman suffrage to the people. Munds was president of the Arizona Equal Suffrage Association at this time. She was a consummate strategist and under her direction, Arizona suffragists created a powerful coalition supporting woman suffrage, made up of miners, labor leaders, farmers, ranchers, Mormons, Democrats, and Republicans. The suffragists worked tirelessly to convince male voters to sign a petition to put the suffrage initiative on the ballot. After completing this task, they had to persuade male voters to support the initiative measure that would give Arizona women the right to vote. They were successful with over 60 percent of voters approving women’s suffrage during the fall election of 1912. Frances Munds went on to serve in the state senate in 1914. She was only the third female state senator in the country and told the press, “Our friends, the true blue conservatives will be shocked to think of a grandmother sitting in the state Senate.” During her term, Munds introduced bills to protect women and children, including legislation to raise pension benefits for widows and to protect young girls from prostitution. She ran for secretary of state in 1916 but lost. For more information, see Winning Their Place by Heidi Osselaer.